I’m hear to change your mind about beets. Cooler weather marks the start of root vegetable season: carrots, potatoes, radishes, parsnips, turnips, and beets. I can see why many think beets taste like dirt because they are root vegetables which grow in the dirt! For my beet and pickled red onion salad, I roast the beets in olive oil and salt to enhance the flavor. 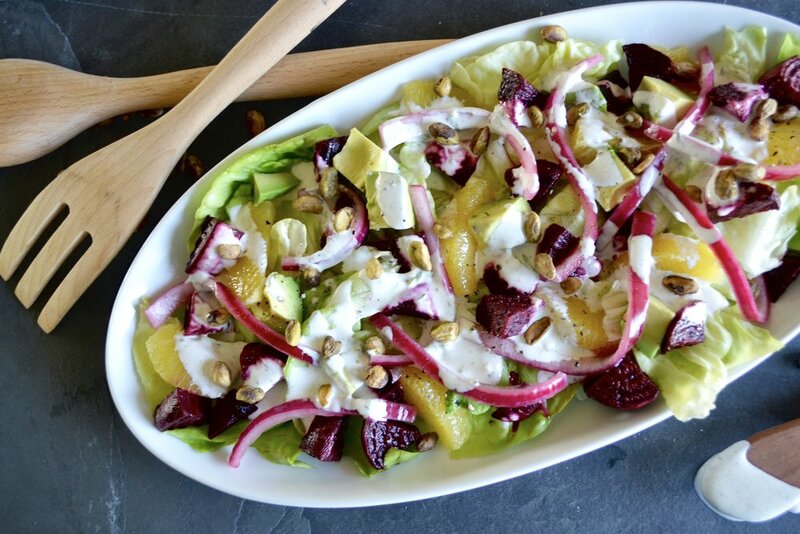 I pair the beets with bright and tangy pickled onions, creamy avocado, sweet orange, and a crunch from pistachios. I follow Lena Gladstone from Lena’s Kitchen on Instagram. She came up with the great (and simple!) recipe for pickled red onions. They have been well received by many of her followers so I decided to test out the recipe. I became obsessed myself and wanted to create a recipe with them. In Lena’s blog post about the pickled onions she suggests using the pickling liquid up to 4 times to get the most bang for your buck. She is totally OBSESSED with these. On her Instagram stories she talks about them practically everyday. I’ve noticed she likes to eat them with her eggs and sausage in the morning. So, I think you get the point. The beets have flavor and the pickled onions are delicious. Preheat oven to convection 350 degrees. To prepare the beets, chop off the green tops and peel the beets with a vegetable peeler. Chop beets into 1/2” cubes. Toss beets with olive oil and 1/2 teaspoon of salt. Arrange in a roasting pan and roast for 25-30 minutes, or until tender. Remove from the oven and allow to cool completely. Rinse and pat dry the lettuce leaves. Tear into bite sized pieces and place on a larger platter. 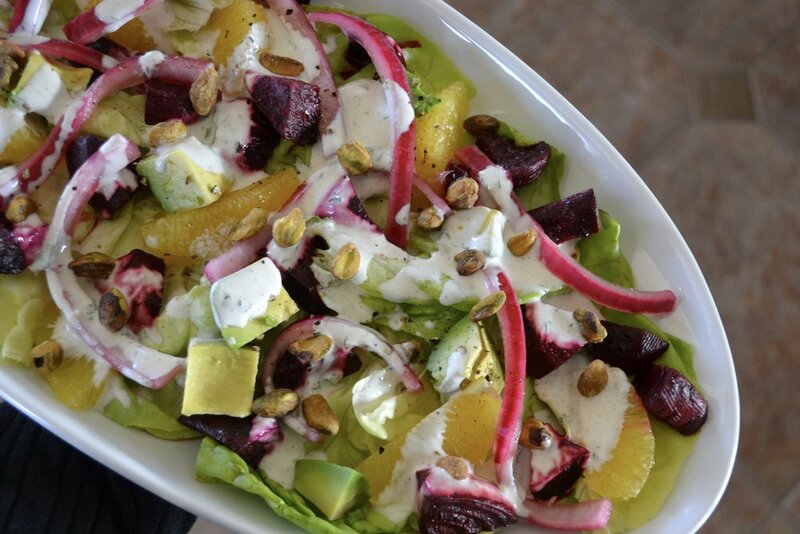 Arrange beets, orange segments, avocado, pickled onions, and nuts. Season with salt and freshly ground black pepper. Drizzle with buttermilk dressing. Peel the red onion, then slice it in half. Thinly slice into half moons. Place the onions into a bowl and rinse with warm water. Drain. Place the onions into a wide mouth quart mason jar. Add the vinegar, water, and salt. Screw on the top and shake to mix everything together. Refrigerate the jar for at least 4 hours, overnight is best. Reuse the liquid up to 4 times. Adjust vinegar and salt each time if needed. Combine all ingredients. Refrigerate for at least 30 minutes before serving.